Near A,C, E, L, 1, 2, 3, M and F trains. 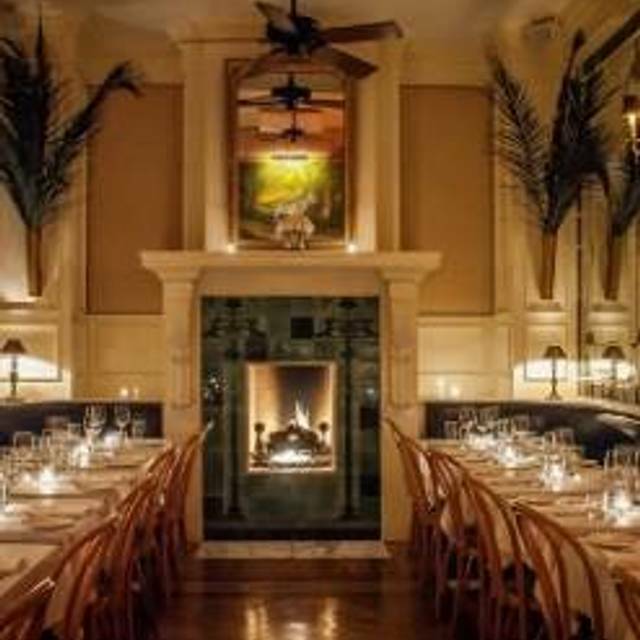 The Beatrice Inn is the embodiment of an underground New York chophouse that has been redefined by Executive Chef & Owner Angie Mar. In its rich history, this restaurant has served as a speakeasy in the 1920s, a neighborhood Italian restaurant for over 50 years, and a night club for Hollywood A-listers. Now, under the ownership of Chef Mar, The Beatrice's meat-centric menu focuses on dry aging, cuts from around the globe, and delicate combinations of fruits and herbs. 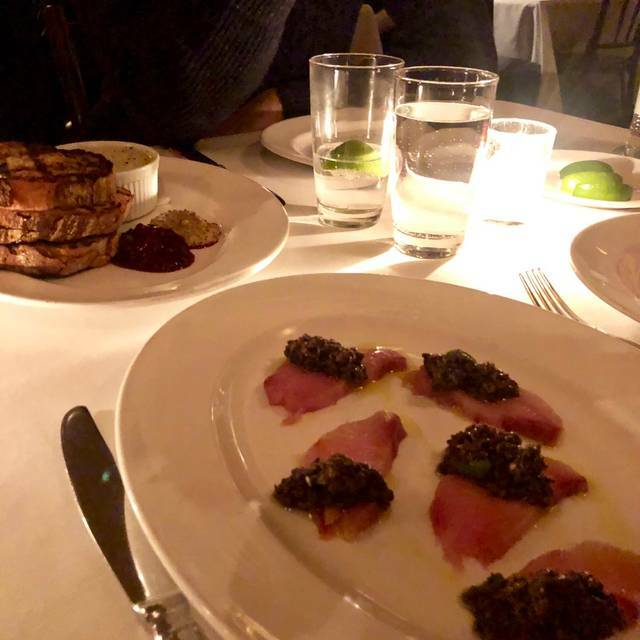 The Beatrice Inn is a West Village restaurant where you can get a good, pricey meal with someone who likes meat and a (mellow) scene. Always the best food and drinks. We make a yearly trip and are never disappointed. This was our second visit to Beatrice Inn in a month after our first with a large group. We’d had a great time and wanted to revisit the experience as a couple. We had the same waiter, Arturo, who was excellent - very attentive and friendly. He took the time to walk us through the full menu and guide us to some great choices, and was chatty and charming without being intrusive. Food was delicious but not for the faint-hearted both in terms of portions and selections. Ambiance was lively and fun, good music - not ideal if you’re looking for quiet romantic evening! We enjoyed it a lot, both as a group and a couple. Highly recommend! The food is SO heavy and rich in general, and definitely expensive! 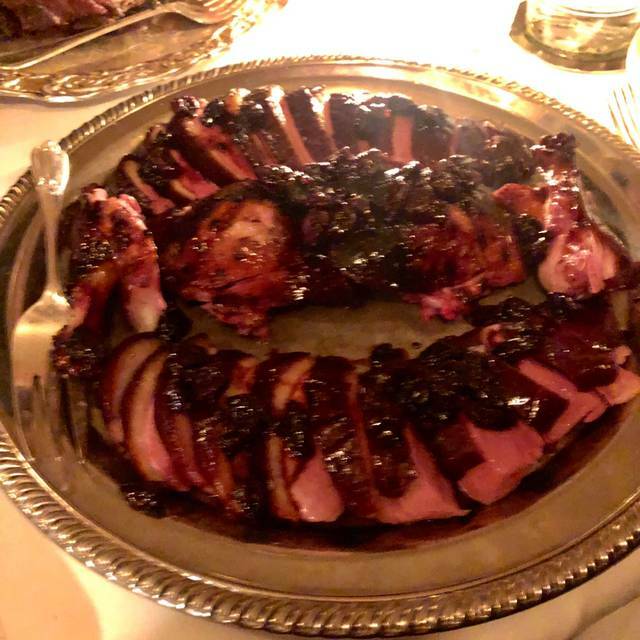 The duck for the table was pretty raw, none of us enjoyed it. But, I've had other great dinners here, so will go back again in the future! Great experience. It is pretty expensive, but worth it. 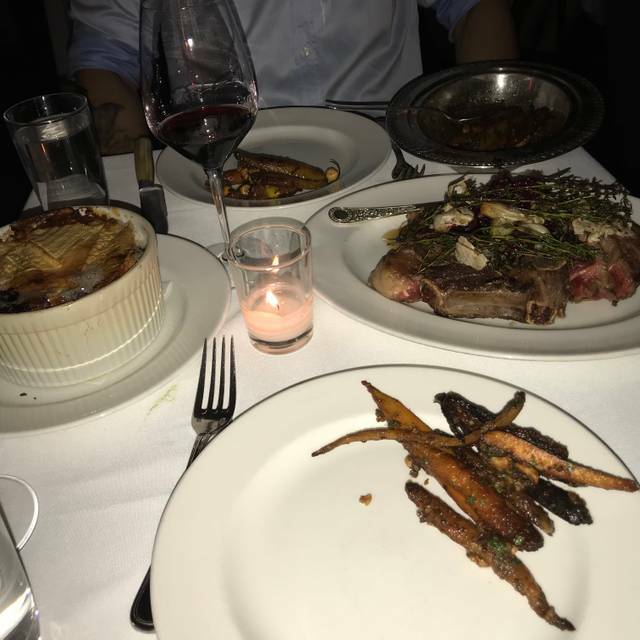 Delicious food, old school nyc, we ordered the duck, wonderful as expected. Great service. expensive. A drink each, 2 appetizers, a duck and hamburger comes to About $150/head. The food was excellent. So thoughtfully prepared and delicious. Clearly everything is the highest quality. The service was impeccable. The server was incredibly knowledgeable and was helpful. The runners were totally professional and almost choreographed in their movements. 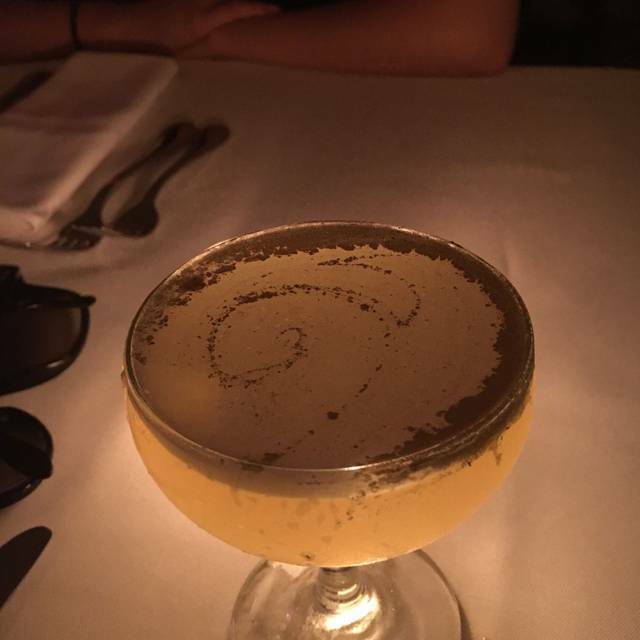 The drinks are fantastic, the ambiance is very special. The stemware, plates, serving dishes are beautiful and make the experience feel elevated and warm at the same time. Really unique dishes and a great choice for a birthday celebration! 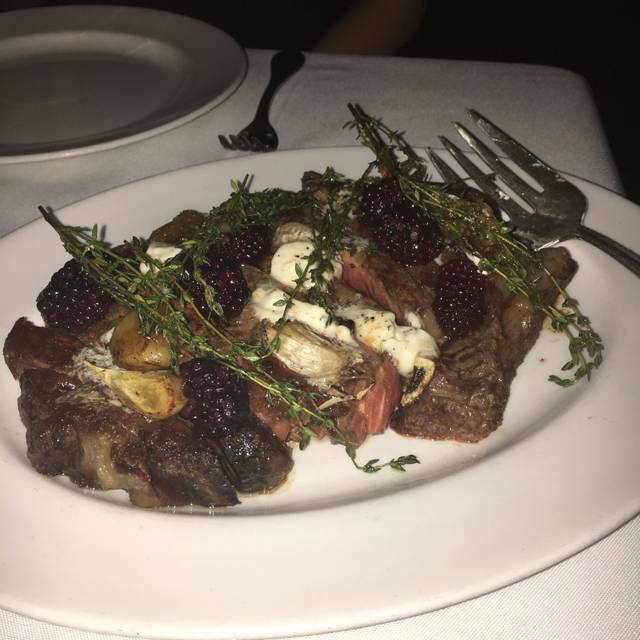 We read about some crazy prices beforehand but overall it was very reasonable for such fine food and the menu online was completely accurate. Fantastic food, cool environment. Only reason you shouldn’t go is if you’re trying to lose weight. The BEST duck we ever had. Glad to finally check this restaurant off my "need to go here" list. 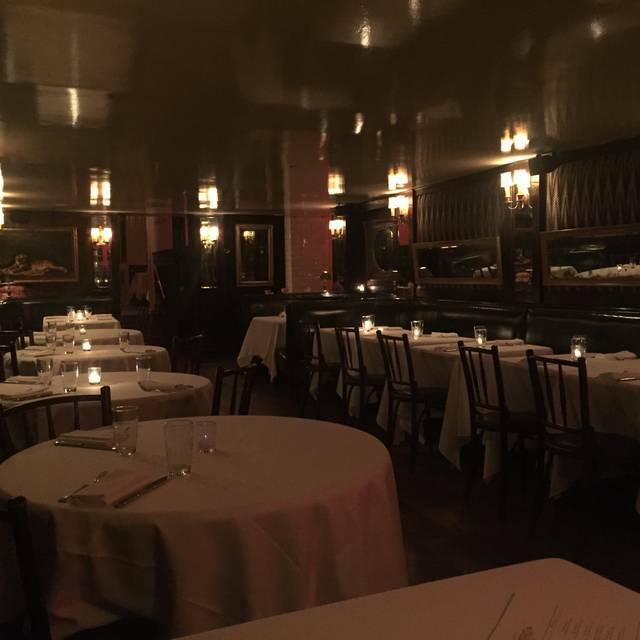 I took my father to dinner for his birthday here and Beatrice Inn did not disappoint. The food was just incredible. Inventive but simple and decadent. Our server was excellent and his attention to detail was great. Cannot wait to come back to visit. Incredible. Service was impeccable and the food was out of this world delicious. The ambiance was outstanding. I would recommend to anyone. The drinks were good. The service was good. The food was great. The food was luke warm, when served. I like my food served hot. Overall a great place for fine dining. I normally would explain what I loved about it but instead I’m going to tell you what you won’t do. You’re not gonna just walk in an sit with any waiter, you have to ask for the buzzed haircut- heavy Nj accent- glasses wearing gentlemen who goes by Steve. You’re not gonna show up kinda hungry, because you would be remiss to skip on the black kale salad*, Spanish anchovy salad, yellowtail crudo apps. You’re not just gonna order the steak bc it’s a steakhouse bc the braised oxtail* and duck flambé need to be paired with your dry aged cote de bouef. You’re not gonna watch your carbs bc on top of the poutine you’re gonna want to order the black spaghetti with langoustines and of-course finish off the meal with the bone marrow creme brûlée* and cake with the bourbon glazed chestnut cake . Finally you’re not gonna just drink beer bc where else are you gonna get your Manhattan served in a crystal serving dish pillowed under a plume of smoke. The food was outrageously expensive- $900 for a fatty piece of beef ??! A plate of pork that was undercooked and filled with grizzle? Mushy side dishes that cost $25 each? The food and the service and the ambience and everything from A-to-Z is simply perfect. You will have a wonderful time here on any occasion. Highly recommended. Outstanding meal which lived up to the billing (pate, kale salad, tomahawk ribeye, bundt cake). Wine steward was thoughtful and provided an excellent recommendation. Service was excellent and frankly some to the comments to the contrary are unwarranted. Speak directly, ask questions and you will be rewarded. Probably not the place for those subject to sticker shock and related hypersensitivity. Overall a great experience. The sommelier is friendly and really helpful. The duck never disappoints. I always love the seasonal changes on the menu, even though there are some dishes I really miss. Can’t wait to go back! I felt for the price, I've had more of an experience. Here's the scoop..$370 for 2 on a prefix of only 4 items. So with drinks, a roughly, $600 tab, was a bit on the higher side, in my opinion for the value. Dinner was pre-fix, so I priced each item on the menu at roughly $46 for.... some oysters, and super buttery toast with some Fois-Gras slices to start, followed by Duck Flambe (which was basically a smoked Duck, that they "flambe" in front of you, that can be served with an aged table steak, or a "flambed" salt-cod, as the main, with a black-kale table salad, and fingerling potatoes with onions for the table. We didn’t know it was a pre-fix menu and the price was much higher than expected for less food than I am used to having as a frequent Beatrice Inn diner. OpenTable app said nothing about the special menu so we were quite price shocked when the bill came, as the menu at the restaurant also didn’t reveal prices. I would recommend this restaurant for meat lovers with particular taste. The cassoulet contains sweetbreads (brains), trotters (pigs feet), and tripe (intestines). The savory plum tart had a beef fat crust - I’m sure it’s delicious. 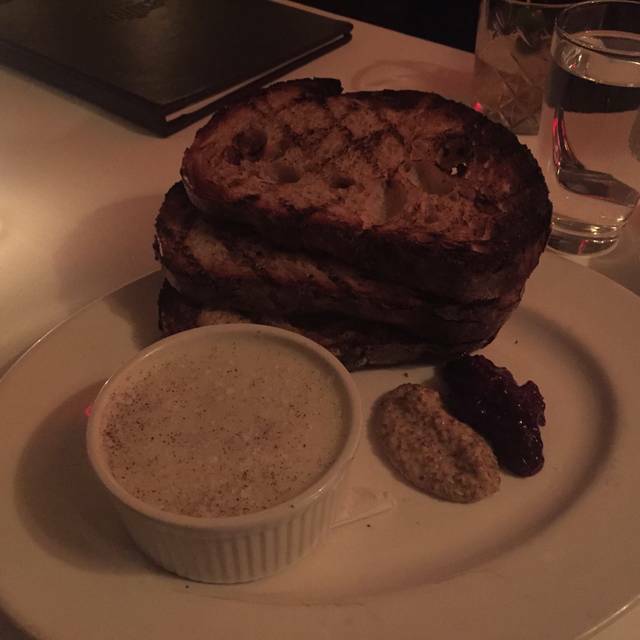 The creme brûlée was made with bone marrow. My salad was delicious and my vegetable plate was very good but the meat and game centric menu was wasted on me. Hostesses were very kind; seated us on-time at a nice table. Bartender outstanding - excellent efficient service as we had s drink before sitting. Tough yo keep our waiters attention; the evening dragged a bit. Very nice evening overall. Ridiculously overpriced and loud, obnoxious try hard crowd. Felt bad for the waitors because it's packed and people are rude to them. Definitely not worth it. I found the whole thing pretty off-putting. When you live in the city, you see a lot of pricey things. I just didn't see anything that justified the obvious premium. The ambiance is nice, but not that differentiated. The cocktails were over the top. The service was sometimes amazing and other times horrible. And for the price, I expected the food to be mind-blowing. It wasn't. We ordered a $40 lobster dish which wasn't even remotely fully cooked. To their credit, they removed that from the bill, but how it got out of the kitchen in the first place, I'll never know. Net-net, they seem to be pretty full of themselves and they seemed to attract an equally ostentatious crowd. Maybe that's the point? To be around other people who think nothing of paying $200 for a piece of chewy steak? Really nice restaurant especially the back room with the fireplace. This is an expensive steak restaurant with other main course options as well. The waiters are professional but can have a little bit of an attitude. We didn’t realize the price point until we saw the menu. Nothing wrong with an expensive meal providing the food quality matches the price. In this case it does. I would recommend this restaurant for the level and quality of it's food. Desserts were ok, but not as good as the food. Beatrice Inn is always a great experience. I would highly recommend it for a special occasion. Every meal there is delicious and I have always received exceptional service. No prices on drink menu so surprised my cocktail was $32 when the bill around. Nice restaurant and quality food but prices overinflated in a neighborhood with places that are cheaper and just as good. Food was good, the service is really Good, but the place is small for all that people. Great service. Perfect meal for a cold winter night. Went for an anniversary. Great ambiance in the back room where couples and parties are seated. Fireplace, beautiful period style and oil paintings on the walls. Front rooms are noisier and more crowded. 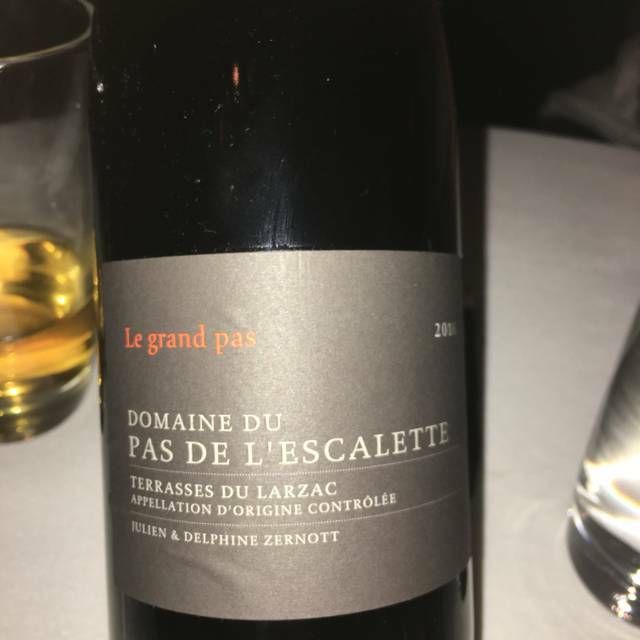 We went because of the oddball menu items...classic/exotic French country dishes (eg beef cheeks, braised ox-tail with prunes, etc) . These were just so-so which disappointed us. Very pricey wine list. Most people seem to go for the shell-fish and gargantuan steaks which are brought out for display before ordering. The waiters can deliver lengthy lectures about the sourcing and style of the various oysters and cuts of beaf making the whole evening into an entertainment, if that's what appeals. We might go back with meat-loving friends interested in spending big bucks on superior cuts of beef and high-end wines in a transporting environment. Impossible menu. No vegetables no individual portions. I wanted a nice steak for one not to be shared with the table who did not want steak. FOOD WAS DELECTABLE AS USUAL! Service very welcoming, friendly and attentive. Very understanding and accommodating on rez screw-up and last-minute rez changes. WILL DEFINITELY BE RETURNING!!! This was our 4th visit to Beatrice Inn and wow has it gone downhill! The food was dry, bland, and cold. Fortunately the manager took it off our bill. To top it off, our waiter was so rude he ruined the entire experience. I’m so disappointed to write this review, as this restaurant is among my absolute favorites in New York City. I will not be returning.